For other uses, see FASOR (disambiguation). A 50W FASOR used at the Starfire Optical Range. 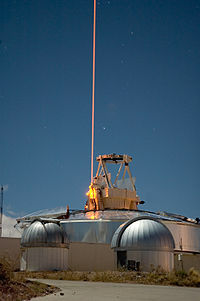 The FASOR is used for laser guide star experiments. It is tuned to the D2a hyperfine component of the sodium D line and used to excite sodium atoms in the mesospheric upper atmosphere. The FASOR consists of two single-frequency injection-locked Nd:YAG lasers close to 1064 and 1319 nm that are both resonant in a cavity containing a lithium triborate (LBO) crystal, which sums the frequencies yielding 589.159 nm light. ^ "FASORtronics LLC Website". Retrieved 25 September 2015.